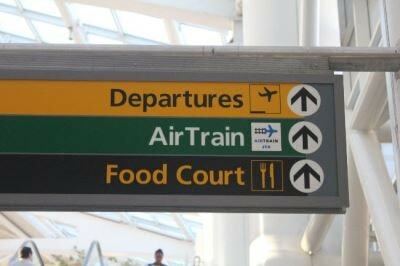 Unfortunately, none of these three airports is conveniently located. It's always somewhat painful to get into Manhattan from these airports. 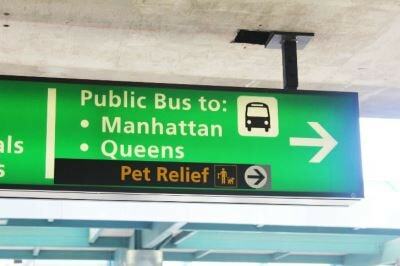 The following sections outline the most popular ways of reaching Manhattan. All modes of transportation take at least 30 minutes. Note that I can’t really cover all possible alternatives (and there are many), and that depending on where exactly you want to end up, there might be some other bus service that will get you there faster. If you have a lot of luggage, taking a cab or a rideshare is generally the most convenient way to get to Manhattan. You won’t have to take multiple trains, ride elevators, or climb stairs. However, cabs can be very expensive and oftentimes take much longer than public transportation, especially during rush hour. If you decide to take a cab or rideshare, be wary of people standing inside the baggage claim area who offer you transportation to the city. It's illegal and somewhat of a scam. Always go to the official taxi stands outside the baggage claim area or use your smartphone to hail a rideshare. The yellow cabs there aren't just famous, they're the real deal. As for tipping your cabbie, please note that the credit card machines in taxi cabs usually provide you with a default choice of a 20% tip. You can change this manually to a more standard tip of 10-15%. 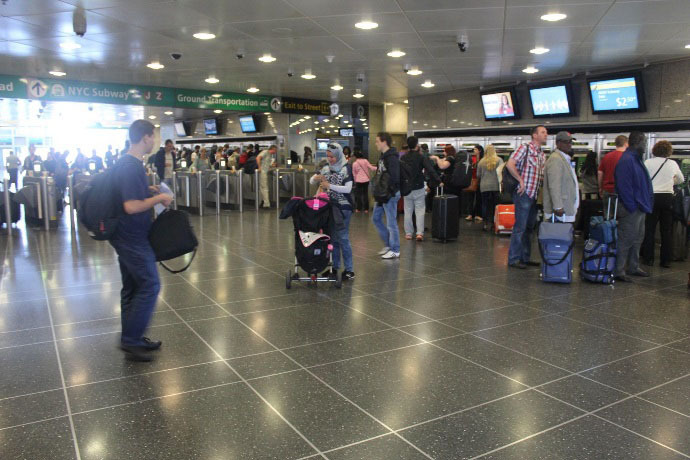 JFK has one of the best train and railroad connections into the city. You have many options and the prices and total travel times are fairly predictable and consistent. Taking a cab from JFK into Manhattan incurs a flat fee of $52 plus toll, tip and a possible $5 rush-hour fee. Because of the flat fee, you do not have to negotiate with the cab driver (and the meter will display the $52 fee right from the beginning). However, to avoid being ripped off, you should reconfirm this flat fee policy before your ride. The ride might take you about 50-70 minutes (depending on traffic and destination). There are now many rideshare companies that can legally pick up (and drop off) people at the airport terminals. This includes companies such as Uber, Lyft, Via, Gett and many others. If you are already familiar with them, you can save some money by using them instead of a taxi cab, especially if you use the carpool option where you possibly share a ride with other strangers (which is safe; New Yorkers do this all the time). The wait time can sometimes be long especially during rush arrival times, so it is suggested to start hailing a ride share as soon as you land. 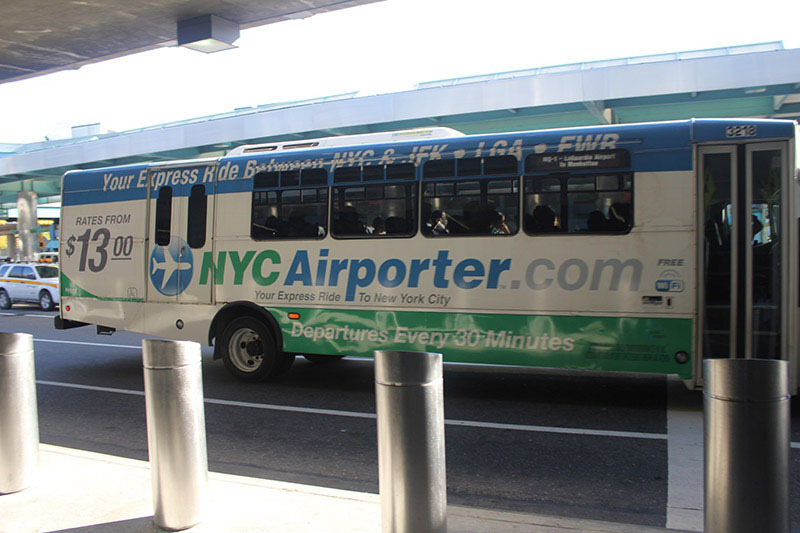 As you exit the terminal, look for white buses that say "NYCAirporter.com". They drop you off either at Grand Central Terminal or the Port Authority Bus Terminal in Midtown Manhattan. The Long Island Rail Road (LIRR) consists of commuter trains that bring workers from outside the city into Manhattan. Because they are for commuters, you will find that they run frequently and can be very convenient. During rush hour on weekdays, there are trains going to New York's Pennsylvania ("Penn") Station almost every 5-10 minutes. You don't pay at the airport terminals to hop on the AirTrain (you'll pay later when you get off). Take the AirTrain to its very last stop at Jamaica Station (this ride alone might take up to 20 minutes). 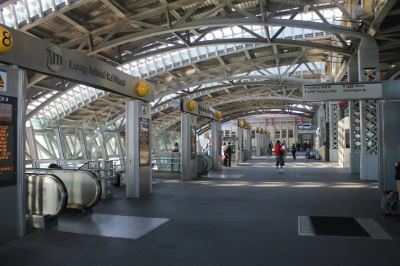 Taking the Long Island Rail Road (LIRR) train from here is very convenient, especially during rush hour (trains go to New York's Pennsylvania Station almost every 5-10 minutes). 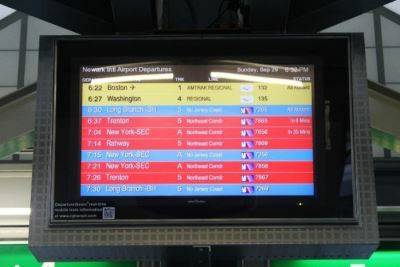 From the displays, you can determine the next train to Penn Station, the track where you can board, and whether the trip would be considered peak or off-peak. With that information in mind, you can then buy the appropriate one-way ticket from one of these machines. On weekdays, that would be $7 for off-peak and $9.50 for peak time. 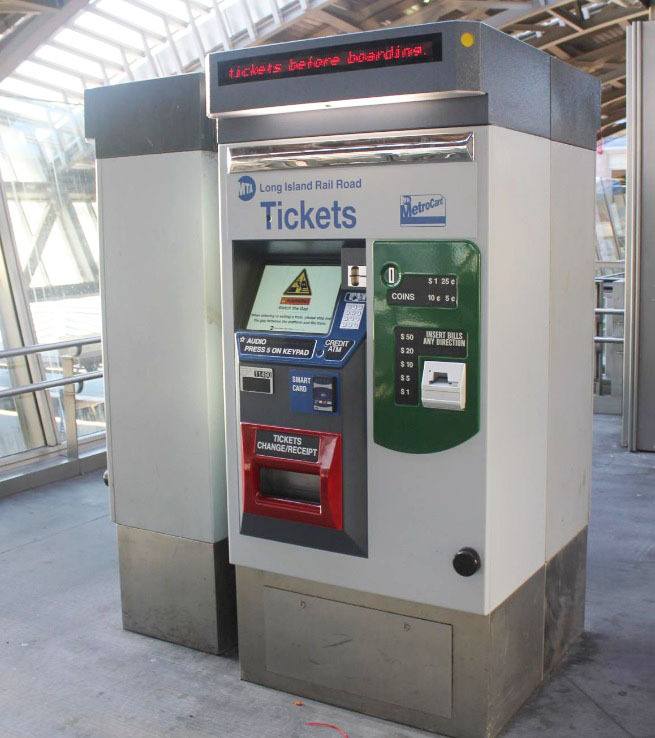 On weekends, you can look for a so-called CityTicket which only costs $4.25. The LIRR train ride from here into Penn Station lasts about 25 minutes and might make a few stops before it arrives there. 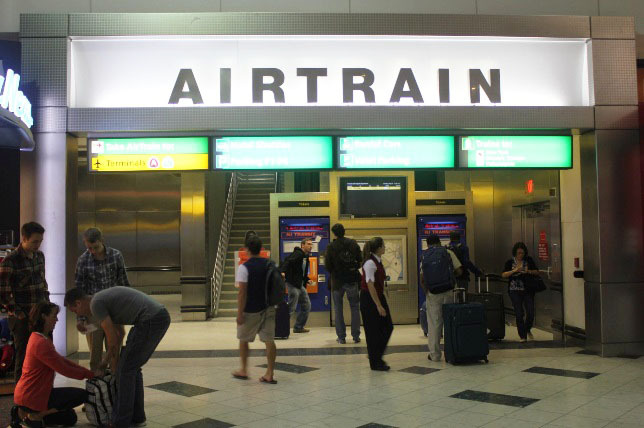 Once at Penn Station, try to remember the area where the LIRR trains arrive. Penn Station is an immensely dense and highly confusing rail station that serves a multitude of trains. 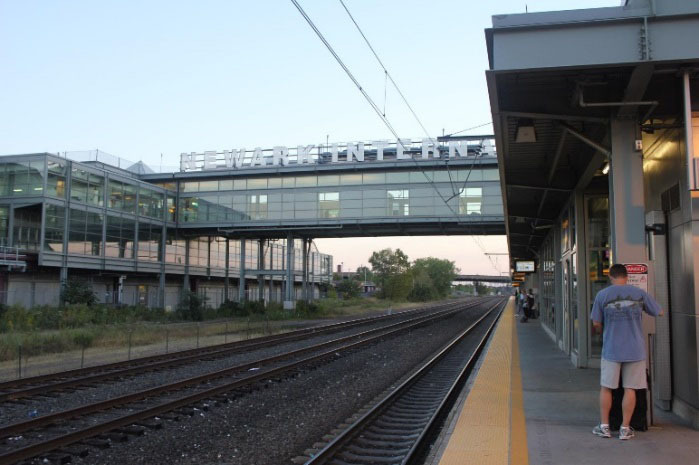 You’ll want to remember the LIRR train area in case you want to take the LIRR back to the airport. Since it's likely that you’ll buy an Unlimited Ride MetroCard for the New York subway trains anyway, you might as well take this travel package and use the subway trains to get into Manhattan from here. 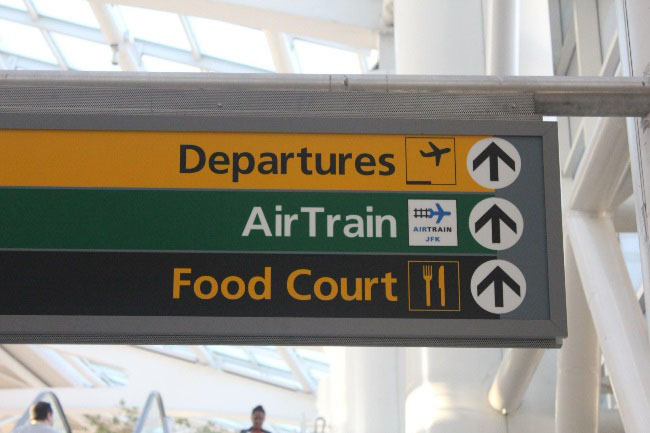 Unfortunately the subway system does not go directly to the airport. 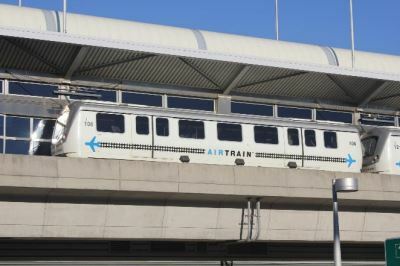 You have to take the AirTrain from the airport terminal to the Jamaica Station of the Long Island Rail Road (LIRR) first, from where you will be able to take the New York subway trains. 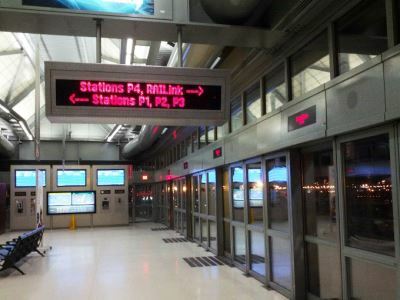 Take an elevator to the bottom floor (Level A), where you will enter the Sutphin Blvd./Archer Ave./JFK Airport subway station, which is served by the E, J, and Z trains. 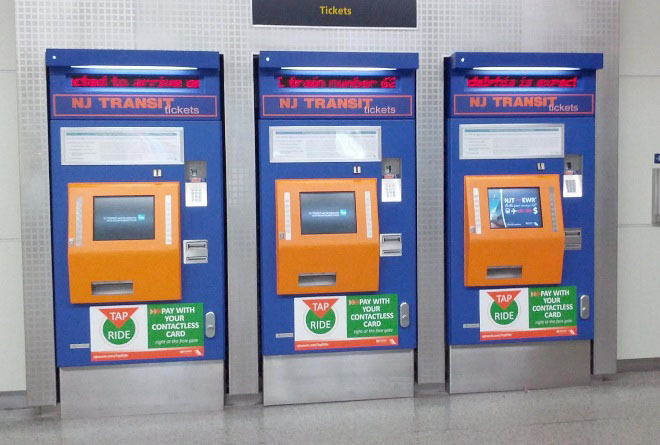 Here you can buy your Unlimited Ride MetroCards for the subway. At this point, you might be approached by strangers trying to sell you used MetroCards. Don’t buy their cards; buy them from the official machines. From this station, take the next Manhattan-bound E train (final destination World Trade Center). The trip from here into Manhattan can take up to 45 minutes. Even though LaGuardia Airport is the closest airport to Manhattan, it does not offer any train or railroad connection to Manhattan. 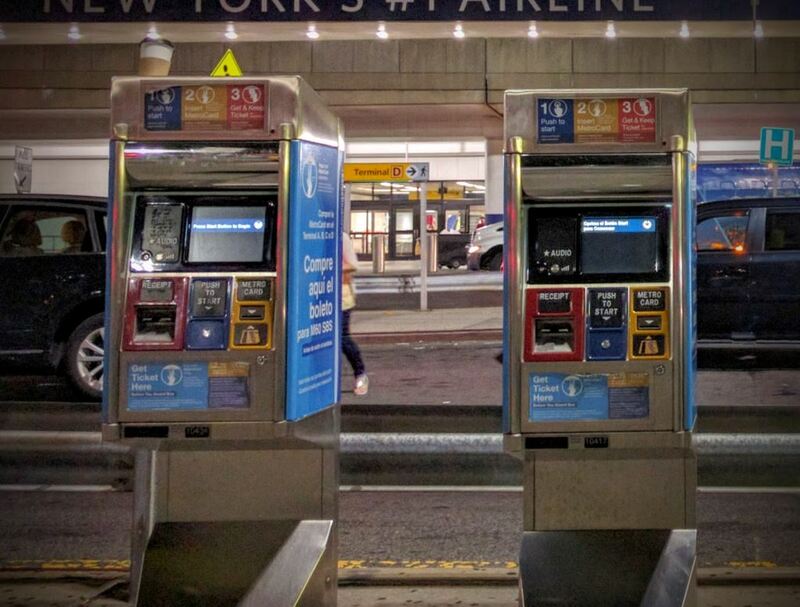 Unlike the JFK airport, there is no flat fee to take a cab from LaGuardia. 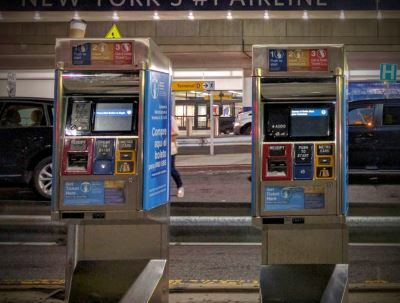 You are going to have to pay the metered fare, which can fluctuate a lot depending on the exact location of your destination and how bad traffic is. Since it's likely that you'll buy an Unlimited Ride MetroCard for the New York subway trains anyway, which provides you with free access to the public bus system, you can take the Q70 Select Bus Service to get to the nearest subway station. 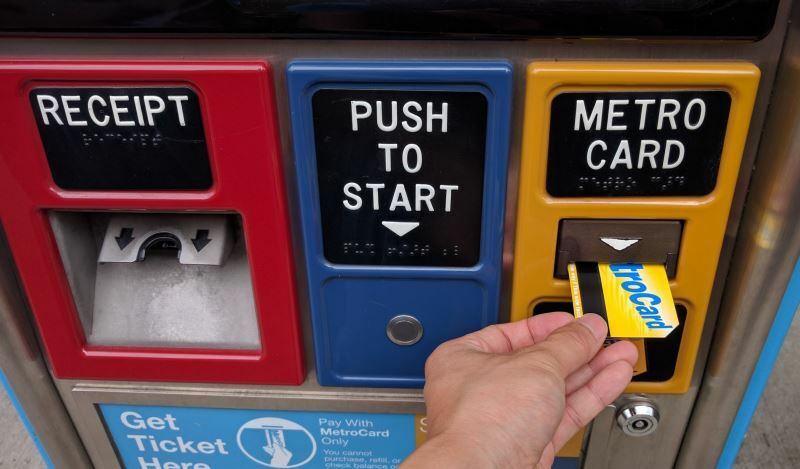 Here you can, and should, buy your MetroCard. This is the same card that you will be using for both the bus and all subway trains in New York. Note that these vending machines do not accept cash. 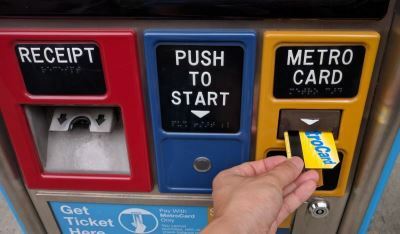 Push the round metal button first and then insert your MetroCard on the right side as pictured below. 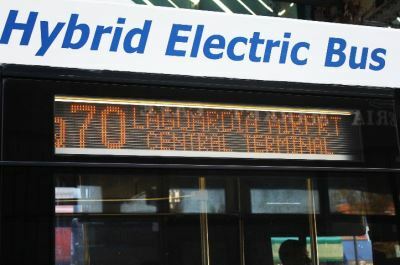 The swipe will be free if you have an Unlimited Ride MetroCard, or it will deduct the typical single-ride price if you have a Pay-per-Ride MetroCard. The machine will dispense a receipt (on the left side). Take the receipt and board the bus using any available door. You do not have to show the receipt to the bus driver. 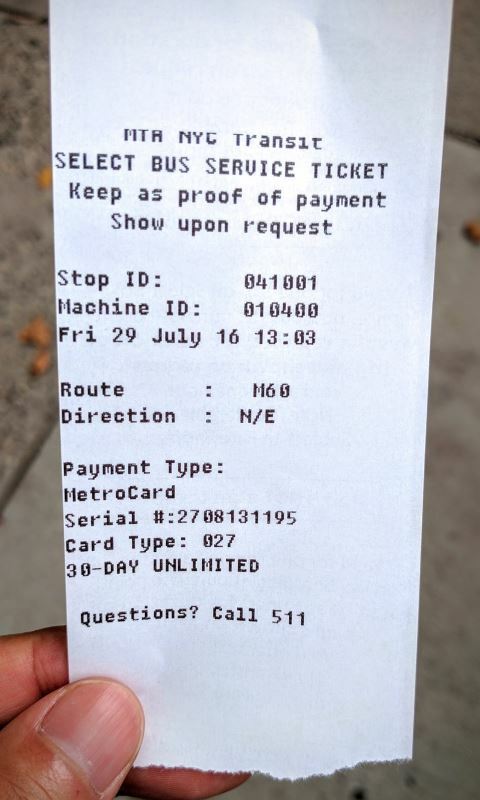 The receipt acts as a proof-of-payment and only needs to be shown when a fare inspector asks you for it. The bus takes about 20 minutes and won't make any other stop until it arrives at the 74th St./Broadway/Jackson Hts./Roosevelt Ave. subway station in Queens served by many different trains. From here, take the next Manhattan-bound train (the E, F, or 7 trains are probably the fastest taking about 20 minutes to reach Midtown Manhattan). Using the same MetroCard as before, entering the subway station here will be free as it counts as a free transfer. If your final destination is Astoria in Queens, or in uptown Manhattan, you might consider taking the M60 Select Bus Service instead. 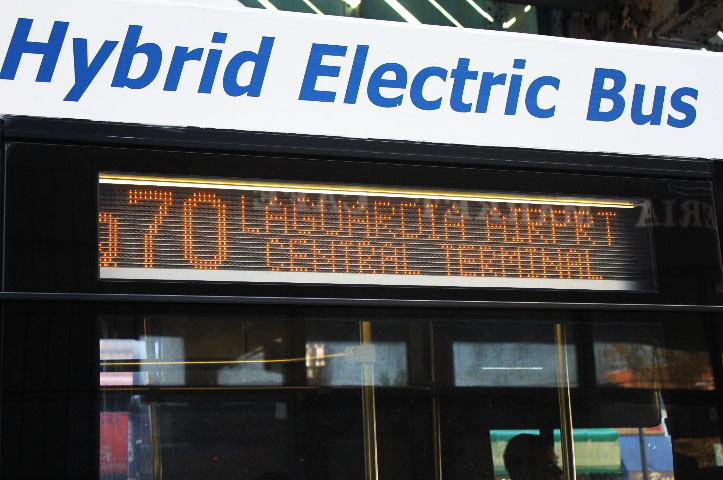 This is a bus that leaves LaGuardia airport and heads west towards Astoria, Queens and then crosses a bridge into Manhattan where it goes on 125th St. through Harlem towards Columbia University/Morningside Heights. Along the way, it will make stops with access to the following subway services: N/Q in Queens; 4/5/6, 2/3, A/B/C/D in Harlem and finally the 1 in Morningside Heights/Columbia University. 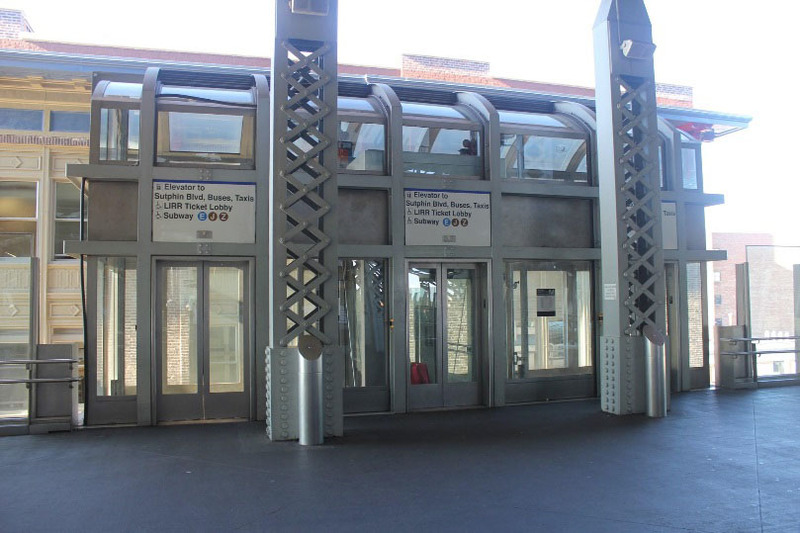 After about 20 minutes, the Astoria Blvd stop will give you access to the N/Q trains. After about 40 minutes, the 125th St and Lexington stop will give you access to the 4/5/6 trains. After about 45 minutes, the 125th St and Malcolm X Blvd stop will give you access to the 2/3 trains. After about 50 minutes, the 125th St and St. Nicholas Ave/Frederick Douglass Blvd stop will give you access to the A/B/C/D trains. After about an hour, the 116th St/Columbia University stop will give you access to the 1 train. Note that the times above are very rough estimates as it depends on the traffic, which can be notoriously bad depending on time of day. As you transfer from the bus into a subway station, the swipe through the turnstile should be free as it counts as a free transfer from bus to subway. 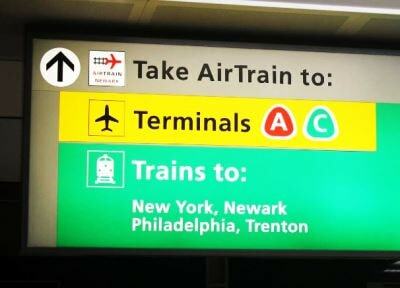 The Newark airport is the farthest airport from New York City. In fact, it's located in the neighboring state of New Jersey. However, it's close enough that many New York City–bound flights land here as well. 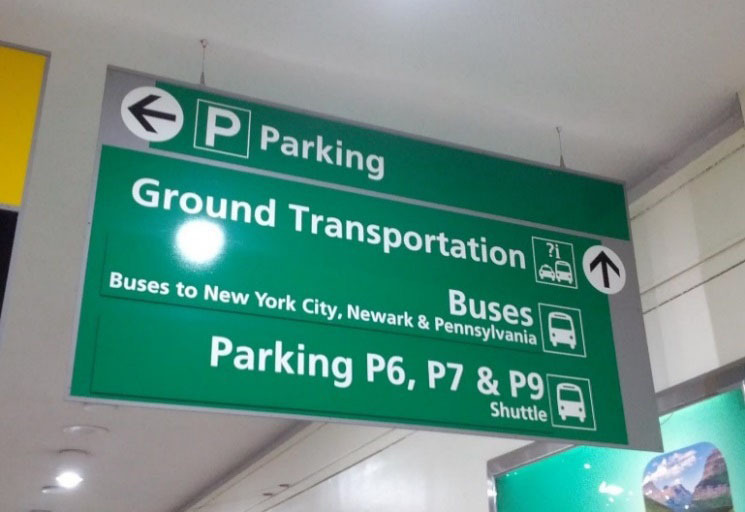 Naturally, the cost of taking a cab from the Newark airport is very expensive. Because the cab has to pass through a few toll booths, you'll end up spending about $90, including tip. Traffic into New York through the tunnels can take some time, too, so it's not always the most convenient way. If you take the Taxi and want to pay with a credit card, please note that at this airport you have to pre-pay your fare at a Taxi pay terminal, get a payment slip and then show your slip to the driver. The terminal will charge you a $5 transaction fee on top of this. The Newark Airport Express shuttle runs every 15–30 minutes. There can be a bit of a wait for all passengers to board the bus and pay their fare, so the wait alone can add some time to your trip. You can pay with cash or credit card on the bus. The bus trip itself takes about 30-40 minutes to reach Manhattan. 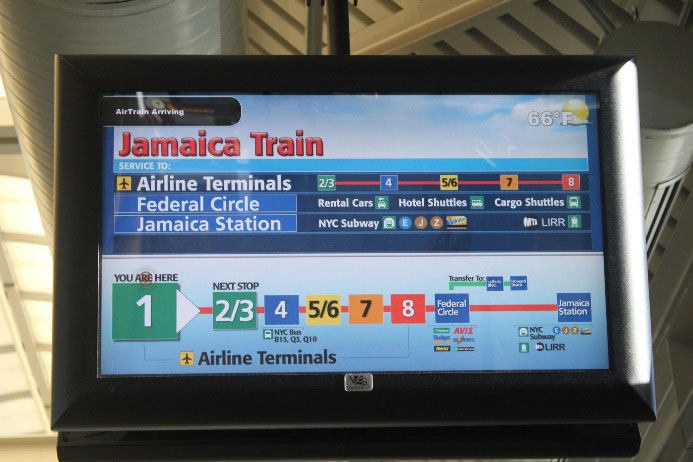 It drops you off in Midtown Manhattan at the Port Authority Bus Terminal, Bryant Park, or Grand Central Terminal. Note that if you take this bus to the airport, the pick up at Port Authority Bus Terminal is somewhat hidden inside the 41st Street tunnel. The New Jersey Transit (often abbreviated "NJ Transit") is a commuter train serving the Newark airport. 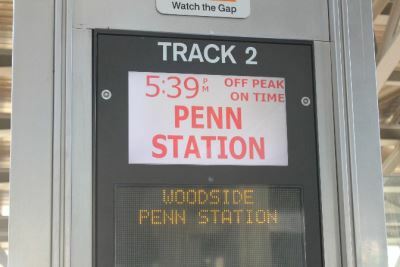 Because this train comes at set times and is not subject to traffic, it is often the fastest way to get into New York City during the weekday. However, it runs infrequently at night or on weekends. 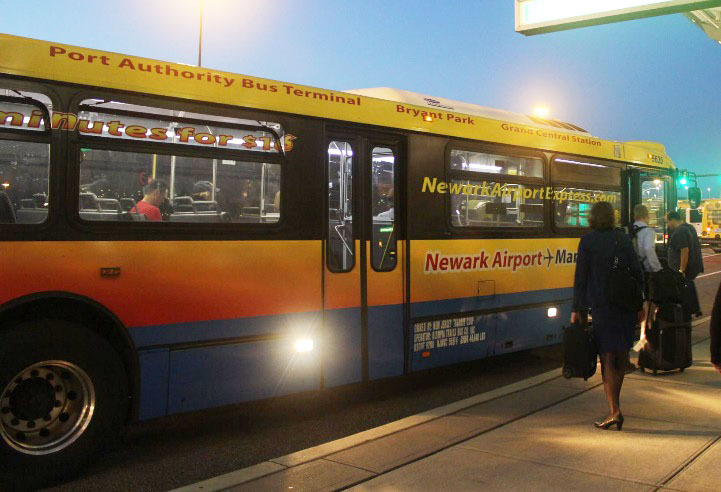 I usually take the NJ Transit when I arrive during the weekday and the Newark Airport Express bus at night or on weekends. The ticket into New York City costs $13. 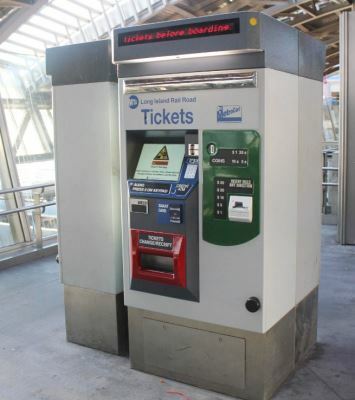 The ticket has a QR code on it and you have to place the QR code against a scanner to be able to go through the turnstiles. Hold on to the ticket though, as you'll need it later on the train. Once you are on the NJ Transit, a conductor will ask to see your NJ Transit ticket again (he or she will also probably keep the ticket). You won’t need the ticket to exit. 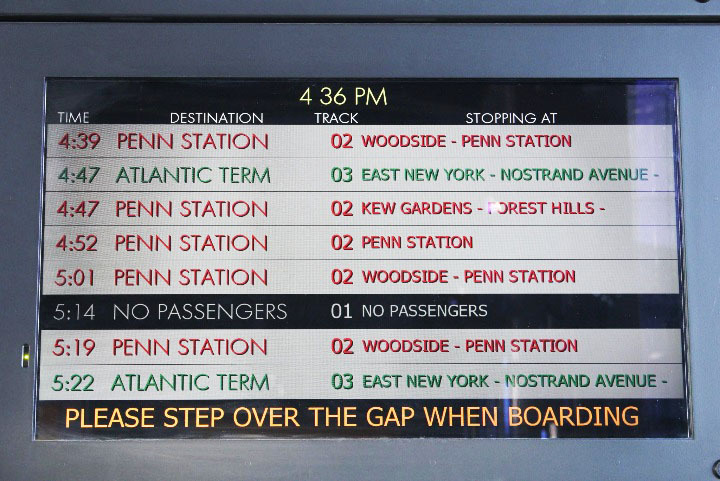 The NJ Transit makes a few stops before it reaches New York. 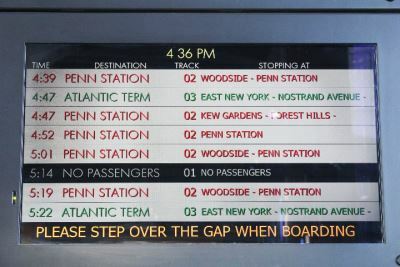 One of the stops might be Newark Penn Station, which is still located in the state of New Jersey. 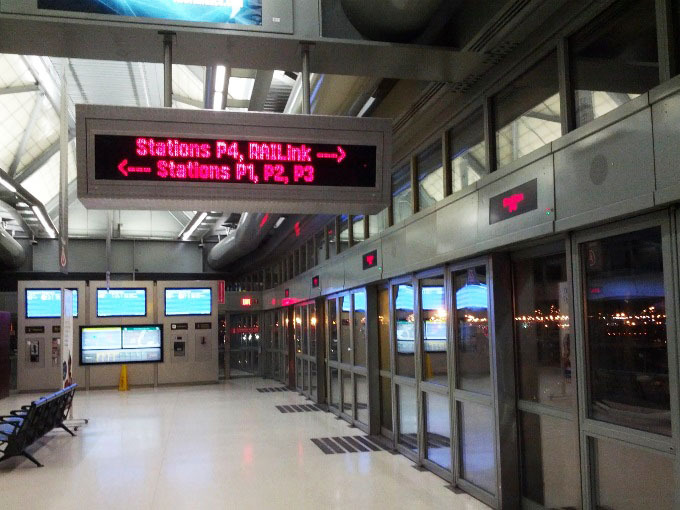 Do not confuse this Newark Penn Station with New York Penn Station (they sound similar). New York Penn Station is the final and only stop in New York for this train. As you exit Penn Station in New York, try to remember where the NJ Transit area is. As I mentioned before, Penn Station is a highly confusing and chaotic station serving multiple trains. You’ll want to remember where the NJ Transit area is in case you want to take it back to the airport. If you do use the NJ Transit to get back to the airport, you will need to use your NJ Transit ticket twice: first to show it to the conductor on the train, and second to enter the Newark AirTrain system to get to the airport terminals.